In B.P.R.D. 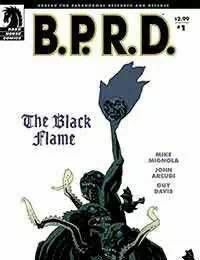 : The Black Flame #1, a bloodbath washes across America as the Bureau for Paranormal Research and Defense turns its attention back to the plague of frogs. While the Bureau tries to interpret bizarre new behavior from the frog men, a madman from the B.P.R.D.s secret history returns to take advantage of the mindless monsters. Mike Mignola takes over cover duties for the sprawling six-issue epic hes crafted with cowriter John Arcudi and the interior-art team of artist Guy Davis and colorist Dave Stewart.